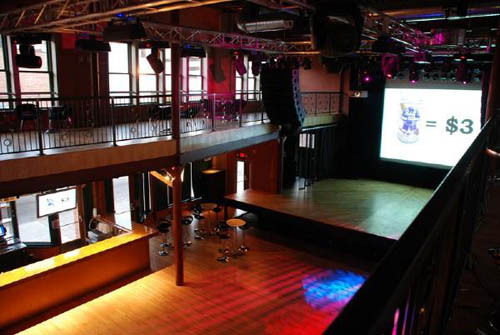 The Pike Room is a second floor area at The Crofoot (see our separate review of The Crofoot here) that holds 250 guests for standing room only events. The seating can be configured however you want to accommodate lesser numbers. This is one of our favorite places to rent out for private events like birthdays, bachelor parties, bachelorette parties, anniversary parties, and other special events when nothing but the best will do. It's also perfect for smaller more intimate weddings. The service is top notch here so you know that they will go the extra mile to make sure that your party is a smashing success. You'll have a private entrance from the street so your guests don't have to mingle with the downstairs bar guests, a full service bar just for your party, an enormous stage with the highest quality professional audio equipment, incredible stage lighting that really sets the mood, flat-screen television sets with DVD capabilities, and free wi-fi so you and your guests can stay connected during the party. Let's not forget to mention the breathtaking views of the city. There's no other venue like this in the area, so if you're looking to rent a gorgeous space for your party, The Pike Room is it! Located on Saginaw Street east of Woodward!